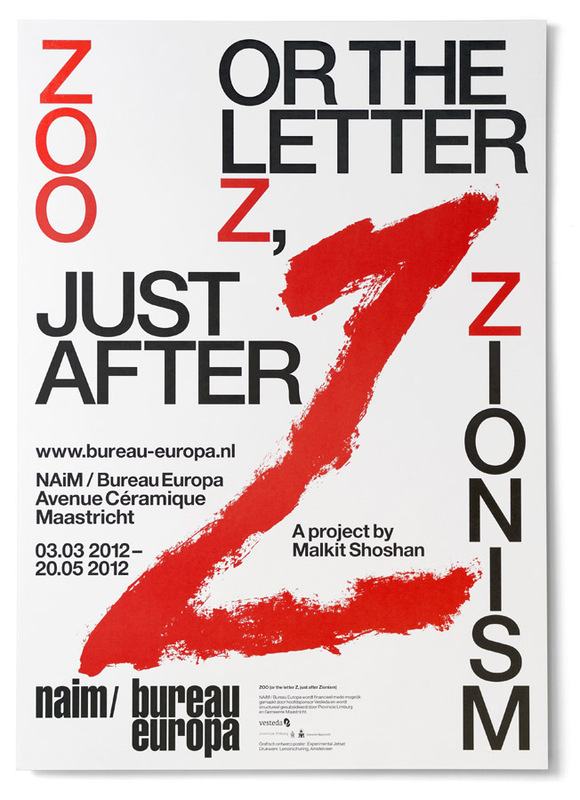 Since 2007, we’ve been responsible for the graphic identity of the Maastricht-based architecture institute which originally went under the name NAi Maastricht, but in 2009 changed its moniker to NAiM / Bureau Europa. (In 2013, the institute even dropped the NAiM-part, and is currently known as Bureau Europa). 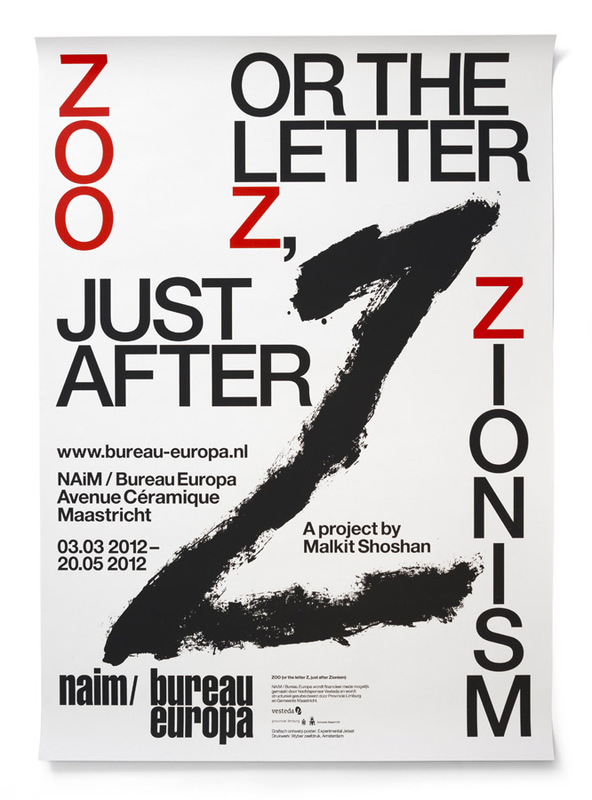 ‘Zoo; or the Letter Z, Just After Zionism’ was an installation created by the Israeli architect Malkit Shoshan, exhibited between March 3 and May 20, 2012, at NAiM / Bureau Europa in Maastricht. For this exhibition, we designed the posters, the invitation, and some typography in the window (the ‘institutional layer’, so to speak). The typography that was part of the actual installation was not done by us, but by Bart de Baets and Sandra Kassenaar. In short, Malkit Shoshan set out to create an installation in which she reflected on the conflict between Israel and Palestina. As a starting point, she used a Reuters photograph of a couple of donkeys in a zoo in the Gaza Strip; more precisely, the photo showed donkeys that were transformed into zebras, with black stripes painted on the poor animals. 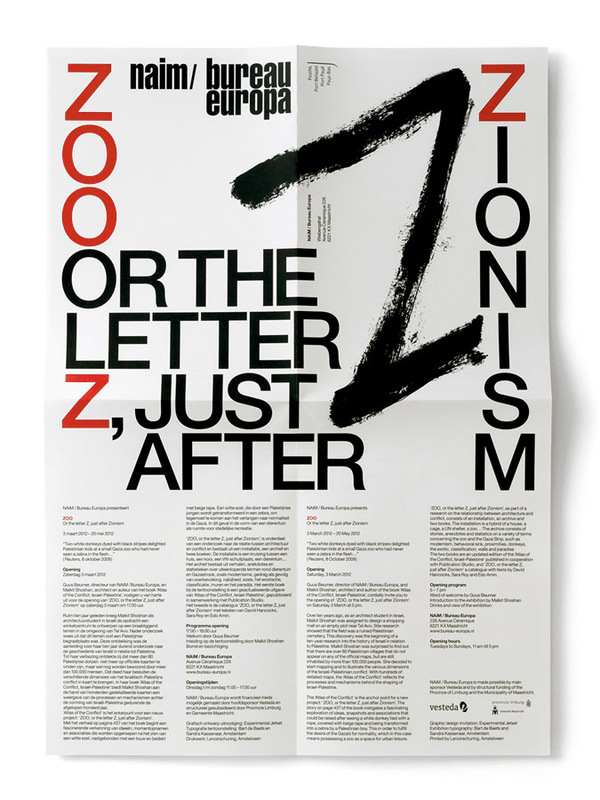 This photograph already played a role in ‘Atlas of the Conflict’, a book Shoshan published in 2010; in that book, the photograph appeared in the dictionary section, under the lemma ‘Zoo’, right after the entry on ‘Zionism’ (which explains the title of installation). 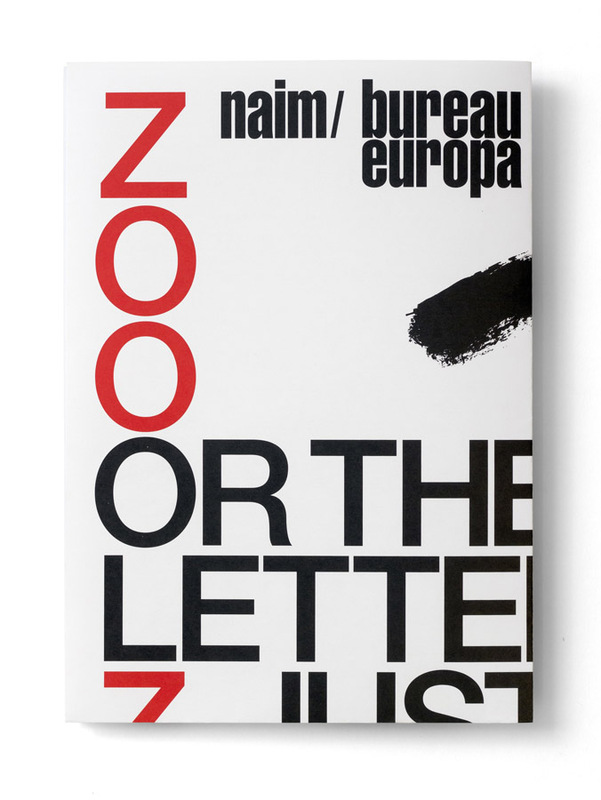 We wanted to translate this dramatic gesture, of painting stripes on an animal, in a graphic way – that’s why we ended up manually painting the letter Z, just to recreate the actual physical act. In the typographic composition set around this Z, we tried to refer to the notion of a dictionary, again emphasizing the letter Z, almost as in a graphic stutter.